"Enter Stage Right is a revelation! My wish is that every Los Angeles child could participate in this program!" Book your Enter Stage Right field trip today! Enter Stage Right is wildly fun, sophisticated & action packed, and is designed to excite students and get them on the edge of their seats, all while teaching the California Visual and Performing Arts Standards. The program features movie star Jack Black in interactive video, and is cross-curricular using theatre to teach math, history and language arts. 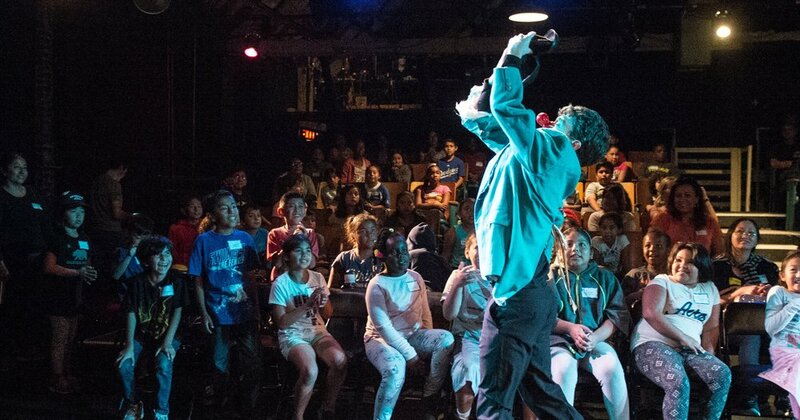 Your LAUSD school could qualify for a free trip through the Arts Education Branch! Contact us for more information and to reserve a date on our calendar this year. ESR catapults students from the ancient history of the theatre to contemporary multimedia production, and brings the magic of theatre to life through improvisation techniques, incorporating production components of sets, sound, lights and live music. From the first moments of the show, when students are welcomed to 24th Street by the fabulous Jack Black in interactive video segments, to the final multi-layered scene developed by the students themselves, the program immerses students in the full theatre experience from buying a ticket at the box office to the power of the spoken and written word. As Educators we provide you with tools to take back to your classrooms and infuse what we do in ESR with your students. Check out this sample curriculum. For more information about booking your school. contact us! "Please know that you make the theatre a classroom and a place of interest that my students and their teachers treasure. Once they participate in the school and theatre workshops their trepidation is replaced with sheer joy. Teachers return to school rejuvenated and the students can’t stop talking about the theatre and the part they played. I want you to know that you impact my entire school...The more adventurous teachers make connections with other subjects and share information during our collaborative conversation Fridays." "Just a quick note to tell you how fabulous the program was for our field trip. We were, once again, so impressed with how engaging and interactive the program was. You captured our attention from the get-go and moved us to tears...Thank you for an experience that will stay with the students and audience for a long, long time. Undoubtedly, you have had a tremendous impact on all who attended." Thank you to the following funders for your support of the Enter Stage Right Program.